There’s no escaping Antonio Brown this offseason. He’s dancing through Drake’s video for the smash single “God’s Plan.” He’s on a nationwide bus tour for Nike Football. He’s catching workout passes from Cam Newton. Now comes the dance in the end zone: Brown is the cover athlete for the Madden NFL 19 video game. The All-Pro Pittsburgh Steelers wideout earned membership in the elite Madden fraternity with superstar production on the field. Although he played only 14 games in the 2017 regular season, Brown led the league in several receiving categories, including total yards and receptions for first downs. Despite a torn calf, he turned in a valiant effort in the Steelers’ playoff loss to the Jacksonville Jaguars. He’s ranked second in the NFL’s 2018 Top 100 list, which is voted on by players. At age 30, entering his ninth season, Brown has numbers on pace with the greatest pass-catcher of all time, Jerry Rice. The Undefeated spoke by phone with Brown from Los Angeles about his life in the fast lane. 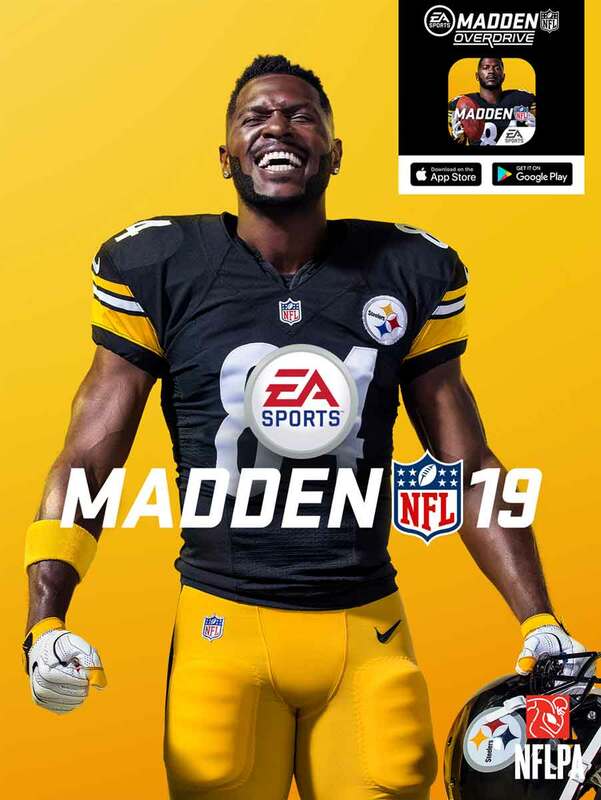 Antonio Brown is featured on the cover of Madden ’19. Let’s jump right into it. Who was your favorite Madden team and player growing up? My favorite Madden team had to be the Falcons with the quarterback Michael Vick, like in ’04, toward the end of high school. That was a big deal to me. He was, like, unbeatable in the game. He could throw the farthest and he could run the fastest. That was always fun, to play with him. Now you’ve gone from playing the game as a kid to being on the cover of Madden NFL 19. How does that feel? I’m so excited to be a part of something special; I’m extremely honored. Not only is business booming, but it’s exciting to know that I’m one of the great players around the NFL. Who are some of your favorite players who’ve been on the cover in the past? Man, Tom Brady, [Rob] Gronkowski, Michael Vick, those are some of the guys. I’m excited to be a part of it. You know what I mean? You’ve got four sons. Do they play Madden now? My sons love it, man. They want to play against me. They want to play with [my player in the game]. They’re all about it. They usually want to play with me, so sometimes I have to go to other teams. If you have to choose another team, who’s that going to be? (Hesitates …) Usually I let them figure that out. I’m Steelers all day, you heard? OK, that’s classified information, I feel you. You’ve also got a lot of eyeballs on you in other areas off the field. Why does all that stuff appeal to you, all of this attention from the world? Obviously I’m not only just a great athlete, a football player, I got good charisma. I was in the Drake video, on “God’s Plan,” had some great opportunities and blessed to be around some great people. I just want to keep inspiring not only on the field but off the field as well. How did you end up in the video? What happened to put you in there? Having a great relationship with Drake and being down and cool with Drake. He called you up because of the Miami connect, because that’s your hometown? What did the theme of that video mean to you, giving all that money away? It means everything, man. That’s what’s life’s about. Life’s not about what you make, it’s about how do you affect others in what you give. I know that Drake was doing something great in my hometown, touching that community, Liberty City, making things better for others. You’re up for an ESPY award for Best NFL Player. One of your competitors for that award is Tom Brady. Would beating Brady for the ESPY take some of the sting off of the results recently between the Steelers against the Patriots? Not really, man. It still has sting because we want to beat them so bad. We’re going to beat them. We have to. What is your message for Steeler fans about this upcoming season? I’m going to do everything in my power to make sure we can win the trophy. That’s my commitment, that’s my focus and that’s what type of energy I’m going to be bringing around everyone, to win the trophy. Let’s talk about your wardrobe for a minute. Describe your fashion style. Man, no basic, all exclusive looks. Comfortable, swaggy, fly looks. What’s your favorite recent clothing purchase? I got these Gucci shorts that match with a suit that’s pretty dope. A shorts suit like LeBron’s in the Finals, or a different type of ‘fit? A little bit like LeBron in the Finals, but the Gucci shorts a little shorter. With a suit top jacket. Blue, with the G’s all over it. OK, when are we going to see it? I’m trying to pick and choose. Maybe put it on the red carpet for The ESPYS. I’m trying to figure it out. Bring that heat to The ESPYS. What’s your favorite current pair of sneakers? I just like comfortable. I’m an off-white Nike guy. I like all the off-white combinations, those are pretty dope. Anything else that you want to add about being on this Madden cover? Man, being on Madden means everything to me. Growing up as a kid, Madden was the game that I looked forward to every summer that inspired me and my brothers to come together with our friends and compete, compete at doing something that we liked to do and seeing players that inspired us to be what we wanted to be. Not only business is booming for me, but I’m one of the great players around the league, so to be on the cover with other amazing cover guys, I’m extremely grateful. It’s an extremely heartfelt moment for me and my family.